A living room is the place where we gather on for family occasions or go to relax after a busy day at the office. Its’ where we sit and chat with our friends and the room that we share with our guests. In a changing technological world, the TV has become a main focal point of this everyday living space. 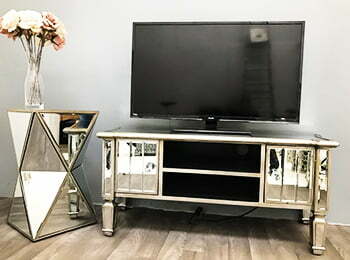 For a wonderfully effective way to display your entertainment center there is the classically considered Mirrored TV Unit. Your friends will want to know where you got the idea for a mirrored tv cabinet and share in the delight of the enthralling display of light and the illusion of space on view. Mirrored TV unit can be fully closed or with open shelves, allowing you to create a complete Mirrored Media Unit. TV Media stands can easily compromise the atheistic of living rooms, but with the choice of a mirrored piece, rather than detract, your glass furniture will only add dazzle to the overall look. Pair it up with one of our mirrored bookcases and your room will look even better. Your friends will want to know where you got the idea and share in the delight of the enthralling display of light and the illusion of space on view. Vintage glam doesn’t have to be confined to the bedroom. This is a concept and furnishing theme that conveys an artistic and crafted look to any room in the house. Your visitors will be bowled over with the instant impact of a Mirrored TV cabinet that houses your keepsakes, photographs and treasures as well as your favourite TV shows. 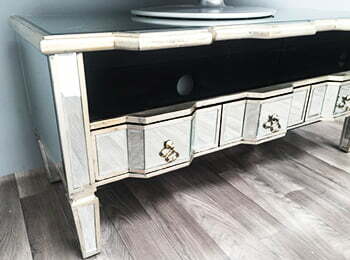 If you’re not inclined towards low-key then your mirrored furniture choices can be as bold and individual as the ones on display in the homes of your favourite TV stars. 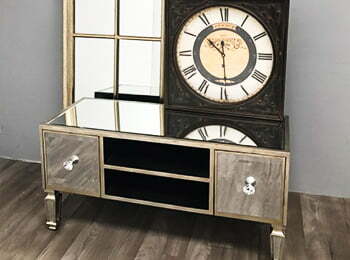 Mirrored glamour isn’t just the reserve of the rich and famous, it’s for those with an eye on interior fashion trends. 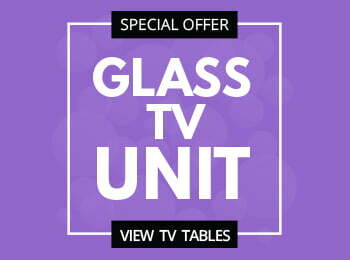 Mirrored furniture TV cabinets and TV stands in the living room can be flawlessly finished with Mirrored picture frames and glass homeware to create a truly inspired space. Framing your TV with Mirrored objects produces a space that enhances your viewing pleasure. In addition it also provides the added feeling of light, space and beauty when your sharing your sanctuary with friends and family. Dare to add more shine with glassware specifically chosen by Interiors InVouge for you? Check out what’s available in the online shopping section of the website. Which is more fashionable, wall units or TV stands?